In November of 1987 I worked on my first parish mission with Fr. Rod Petrie, OFM and Fr. Brennan Connolly, OFM. Brennan has gone home to the Lord and Rod is still going strong at close to 85 yrs old. Since then I have preached over 400 parish missions all over the US and in parts of Canada as well. It has been an exciting and rewarding time. What is truly amazing to me is the fact that the good Lord has opened new doors for me in this wonderful ministry doors to possibilities that I never even dreamed of back in 1987. A chain reaction of events began four years ago and the chain is still growing. Back in 2009 a friar suggested that I start a blog. It was well received and I have been using it ever since as a tool for preaching the Word. Shortly after beginning this endeavor I took the plunge and signed on to Facebook. I had shyed away from this social media site because I had heard some of the horror stories related to its misuse. I soon learned, however, that Facebook was a nice complement to this blog. I could let people know where I was serving at different times and create links to articles and talks that I found helpful, not to mention letting my Facebook friends (393 of them now) know of this blog. Many of them in turn have shared the blog with their friends and the message goes out far and wide. I also keep up with family and with news of what many of the friars in my province are doing. Twitter, at first, seemd trivial and silly. I had heard of all the crazy "Tweets" from athletes and movie stars and figured that this outlet was not for me. Just before Lent of 2012, however, a priest friend suggested that I take another look at Twitter. He told me that the key was sticking to one type of message and not straying away from that. He said that if I put out only religious messages that I would build up a following of people also interested in that type of message. I jumped on board Twitter and Tweeted every day of Lent, 2012, on the readings of the day. I rapidly built up a following and have received wonderful messages from those followers which now number just under 2500. When many of them "retweet" my messages to their followers the whole thing multiplies. I repeated the Lenten "Tweets" in 2013 and apart from Lent put something on their once or twice a week. What has happened is that the blog, Facebook and Twitter weave together to be an internet ministry which reaches thousands and which enriches me in return. In the midst of all of this it was suggested to me that "The Wandering Friar" could be a book title. Most of you know that the book has been out for several months and has been well-received on the missions I have preached as well as in the parishes in Wisconsin where I served in the summer. I was recently invited to give an interview on the book on CatholicTV in Boston. This channel airs in Boston, Detroit, St. Louis and sever other cities on regular broadcast outlets. It is also able to be seen everywhere on CatholicTV.com. On October 15, the Feast of St. Theresa of Avila, I celebrated Mass on that channel and gave the interview on a program called "Start the Day". The links below will give you the interview as well as the homily from the Mass. The latest outflow from all of this is that the folks at "Tekton Ministries" of Indiana discovered my blog and read the book as well. This led to an invitation to lead a pilgrimage to Rome and Assisi which I will be doing on October 6-16, 2014. Details will follow soon. As many of you who read this blog are aware I have now published a book called The Wandering Friar. As I finished this work I had several strong feelings--relief that it was done, satisfaction at an accomplishment, fear that it wouldn't be accepted and GRATITUDE. I have long been thankful for many of the blessings that the good Lord has given me in the course of my life, but writing this book about the people that I have encountered along the way made me feel especially blessed and grateful. Interestingly, one of the most common comments I have received from readers of the book is, "What a blessed and wonderful life you have lived, Fr. John." I make the above observations in light of this Sunday's Gospel reading from St. Luke, the story of the curing of the ten lepers. (Lk 17:11-19). The story, of course, contains a lesson on gratitude that most of us can remember since childhood. It certainly reinforced every parent's instruction to always say please and thank you. But why didn't the other nine come back to thank Jesus. I can think of several reasons. 1. In the leper colony you were cared for. They all had to find jobs and a place in the community. Just too busy to go say thanks. 2. Entitlement. Some of them perhaps just had acne or psoriasis which was falsely labeled as leprosy. They were glad to be out a place they never should have been. 3. Fear of standing out and calling attention to themselves. Let me get on with my life and stay out of the limelight. Also, I could get in trouble if I hang around this Jesus and am seen as one of his followers. 5. Yes, in some cases just plain ingratitude. 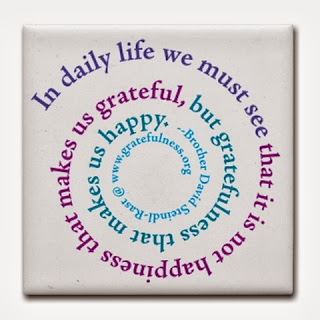 The point I'm making here is that most of us want to be grateful but we get impeded at times by all of the above attitudes. Which one most applies to you? to me? As I finished my book I realized that number 4 above was a challenge for me and so I try at the end of each day to think of at least 3 people or things I am thankful for on that day. Usually the list is longer than three. The word Eucharist is derived from the Greek word for thanksgiving. It is a great act of thanks to the Lord for His saving work in us. Let us always be mindful of that. Let it lead us to be thankful for all of our blessings. One additional notice, though unrelated to the above reflection. On Tuesday, Oct. 15, I will be celebrating Mass on CatholicTV.com. After the Mass, at 10:30, there is a program called Start the Day, during which I will be interviewed about my book. Both will be re-broadcast at 7:00 PM and 7:30 PM. In Boston and vicinity it will be on channel 68. Otherwise you watch it on your computer, not on the TV.